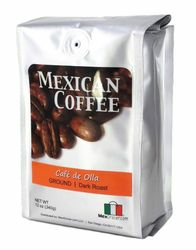 MexGrocer.com proudly brings you authentic Mexican coffee 100% cafe arabica from Chiapas, Mexico. 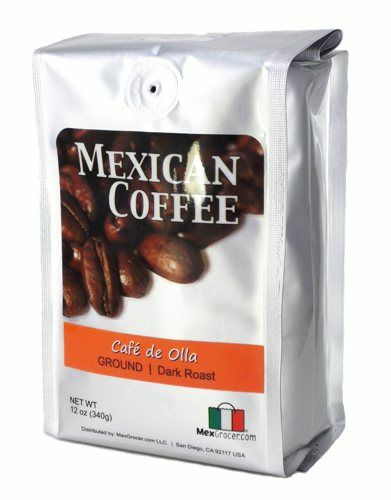 This flavored coffee, as we may know it, "cafe mexicano", is full bodied with overtones of cinnamon and piloncillo (dark brown sugar). Its varietal comes from typical coffee plants, which has an excellent cup quality. We have hand picked our beans to bring the perfect aroma and acidity levels that are ideal to the coffee connoisseur. In fact, we're so sure you will love our arabica coffee that we're willing to give a 100% money back guarantee. El cafe de olla es un tipicamente Mexicano con sabor a canela y azucar morena o piloncillo y se acostumbra tomar en jarritas de barro. A friend had brought me a bag of cafe de olla from a trip to Mexico a few years back, and I liked it so much that I had made it myself a couple of times. Based on these experiences, I was expecting this coffee to taste more like the spices that are included in the blend, but I could barely taste them. We got this to try and the first thing my husband said when we were brewing was "It smells just like my Grandmothers in Mexico in here!" Very smooth and very tasty!!! What can I say? I feel in Mexico again....no comparison with the commercial coffee such Nestle'... Way to go Mexgrocer!